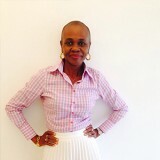 Rita Okagbare is a prolific health educator, and was instrumental in educating Nigerians about the Ebola virus during the 2014 Ebola breakout. With a masters degree in public health, she has served in several parts of the Federal Ministry of Health. She is the mother of an albino child and is passionate about enlightening the public on albinism and helping parents understand albinism.